Natural Living Skills 2 - A 2 day programme involving theory, practical, demos plus two nights wild camping in the woods. Making and cooking bread over your campfire. Tinder box - natural and man-made materials. Participants will receive our "Natural Living Skills Patch" with the Tipi Adventures Ireland NLSProgrammes Logo at the end of the workshop. 18+ unless accompanied by an adult. * All participants must sign our waiver form. Camp set up Fri afternoon/ evening. 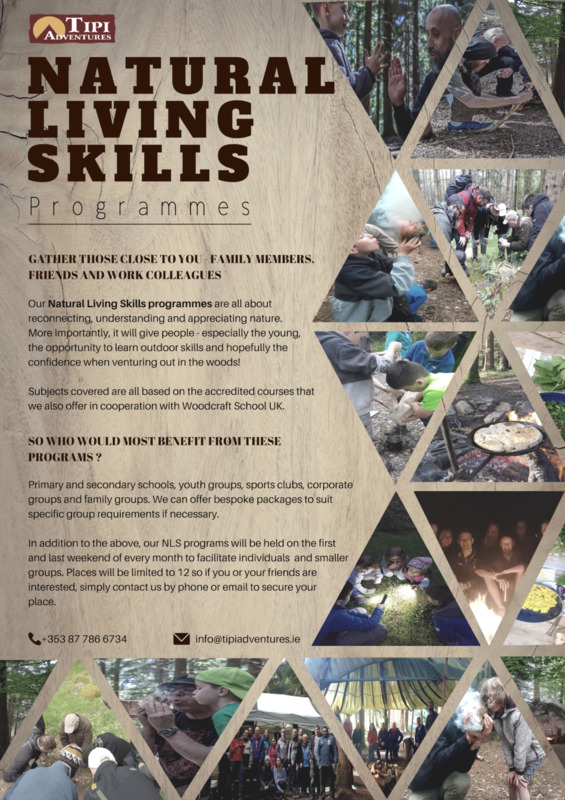 Special Note: In Cooperation with Woodcraft School Uk, our Natural Living Skills programmes will give people an insight and understanding of some outdoor skills. Programme content is based on the Woodcraft School accredited courses which are certified by NCFE UK. These programmes are suitable for young and old alike providing a solid foundation to continue and do the accredited courses if they wish to obtain a certificate. We have the Level 2, suitable for people up to 18yrs old and the Advanced Level 3 Bushcraft Award, for 18yrs and over. There will be other courses and workshops available at our private wilderness site in Wicklow for 2019. Check for details and dates in our website and facebook page. Book early to secure your place.